Like many readers, I was confused and disheartened when the Pulitzer Prize announced there would be no award for fiction this year. For booklovers, and especially for writers, that would be like the Academy Awards announcing there would be no Best Picture. Huh? Turns out, the Pulitzer jurors were just as shocked as the rest of us. They came up with three finalists: The Pale King by the late David Foster Wallace, Swamplandia by Karen Russell, and Train Dreams by Denis Johnson. Perhaps too many choices, because the Pulitzer Board, also basically a committee, could not pick one either. Really, this is just another case of death by committee and not a commentary on American letters. The same thing happened in 1974 when the jury voted for Gravity’s Rainbow by Thomas Pynchon, again unanimously, but the board overruled. Other important books that year included Fear of Flying by Erica Jong, Burr by Gore Vidal, Breakfast of Champions by Vonnegut, and Sula by Toni Morrison. Three years later, the Jury picked Norman McLean’s A River Runs Through It, but the Board gave no prize. Two biggies they also skipped over: Sophie’s Choice by William Styron and Roots by Alex Haley. There are several other notable misses in Pulitzer history. There was no award in 1920, even though Winesburg Ohio, by Sherwood Anderson, was eligible. Again in 1954, though both A Good Man is Hard to Find & Other Stories by Flannery O’Conner and Go Tell it On the Mountain by James Baldwin were in the offing. Ten years later, another blackout in 1964, even though Sylvia Plath’s The Bell Jar was eligible—that stings. But, so were V by Thomas Pynchon and Cat’s Cradle by Vonnegut. Note, Where the Wild Things Are and Hop on Pop also came out then—so it was boon year for American readers. In 1971, they passed over Deliverance by James Dickey, as well as Being There by Jerzy Kosinski and The Bluest Eye by Toni Morrison. Now I’m not arguing that that any one of these books should have won the Pulitzer—though others might. What I’m saying is that past years which yielded no Pulitzer for Fiction were all still fairly robust ones for American letters. 2011 was no different. Indeed, Britain’s prestigious Orange Prize just announced that three novels written by American women made the six-book shortlist: Foreign Bodies by Cynthia Ozick, The Song of Achilles by Madeline Miller, and State of Wonder by Ann Patchett. On Twitter, via the hashtag #TwitterPulitzer, readers and bookstores have nominated The Art of Fielding by Chad Harbach, The Buddha in the Attic by Julie Otsuka (I thought this was a tour de force), The Marriage Plot by Jeffrey Eugenides and several other must-read contenders. Check it out for reading ideas or to post your own #TwitterPulitzer winner. As this weekend marked the 100th anniversary of the sinking of the RMS Titanic, I decided to read A Night to Remember by Walter Lord. I had never read the classic, which was first published in 1955, has never been out of print, and is still considered the definitive text on that disastrous event. I can’t believe I hadn’t picked this book up before—what a gripping read. Lord did exhaustive research, interviewing survivors and studying all the newspaper accounts. Though it’s not just the facts, but Lord’s pacing and the way he metes out the many small moments that make this book so memorable. Lord writes with a crisp, descriptive hand. “The Atlantic was like a polished plate glass; people later said they had never seen it so smooth.” Even 60 years later, the book holds up and does not feel dated. We’ve all heard much of the Titanic lore. For example, there’s the much-repeated story of the cook who got drunk and thus survived in the freezing water. He has a cameo in the James Cameron film, clinging to the rail of the stern next to the mawkish Jack and Rose (Leonardo DiCaprio and Kate Winslet). In fact, reports Lord, Chief Baker Charles Joughin treaded water in the 28-degree ocean for four long hours—no wetsuit! That’s a Navy-Seal caliber achievement. I love the scene in which Joughin calmly enjoyed a whiskey in his cabin as the water lapped up over his shoes. The book holds so many small precious stories, true ones. Two young men, new friends that night, shook hands and jumped off the rails together—one lived, one drowned. Men worked furiously in boiler room 5 pumping water and keeping the coal burning for ship’s lights (and the wireless). John J Astor IV disguised a ten-year-old boy in a floppy girl’s hat so the lad could get into a lifeboat. I did not know boys that young were considered ‘men’ and thus not included in ‘women and children first.’ Instead, they were told to buck up as they watched their mothers and sisters drop down in the boats. Oh, and those officers on the nearby SS Californian who watched the whole thing, flares and all? Darwin Award. Titanic lifeboat shot from the RMS Carpathia. Image: Public Domain via Wikipedia. Instead, the RMS Carpathia raced north. I hadn’t realized this was such a full-court press, with them turning off the lights, heat, and hot water to send all power to the engines. 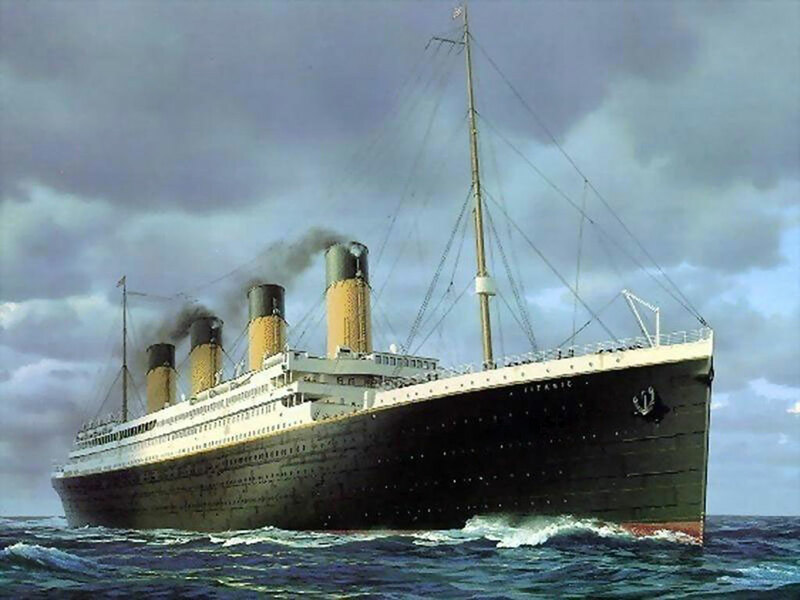 Even after Titanic sinks, Lord takes us through the tensions and the struggle to survive in the lifeboats, several of which were swamped with water and listing themselves. A Night to Remember was so riveting that I did not pause to turn on “Downton Shipwreck,” Julian Fellowes’s four-hour TV saga. Full disclosure: I did dvr it. Still, I get a little frustrated with these fictionalizations as I’m more curious about the actual events. “Truth is stranger than fiction,” said Mark Twain (and/or Lord Byron). And, it’s certainly more gripping than melodrama. After all, what could beat the story of the sinking of the “unsinkable” ship? Industry was vanquished, and its magnates, such as Astor and Benjamin Guggenheim, were also proven vulnerable. The ship’s demise marked the end of an era. Some say the Edwardian Era, others the Belle Époque. “To anybody who lived at the time, the Titanic more than any other single event mark[ed] the end of the old days, and the beginning of a new, uneasy era,” wrote Lord. The ship has since become a cultural phenomenon, spurring myth, discussions, and fascination for a century now. Lord wrote a sequel The Night Lives On, highlighted with several other picks listed as “Best Titanic Books” on Goodreads. There are also several recent releases to mark the centennial reviewed by The Washington Post. And, The New York Times Book Review just spotlighted two new books that deal with the aftermath of the survivors. Several of whom committed suicide in the years after. But my favorite take on all this Titanic hype is Book Riot’s “What Books Were People Reading on the Titanic?” Talk about a meta must-read. Book Riot: What Books Were People Reading on the Titanic? Some people found this distracting and wanted one narrator and one story. But for me, the first-person chorus worked to convey both the scope and the intimacy of these women’s experiences. So many were packed onto the boat: girls from small mountain hamlets who had never before seen trains, aloof sophisticates from Tokyo, daughters of farmers who’d wished they’d had sons, a widow from a silk-weaving village, and the youngest, a twelve-year-old girl from the shores of Lake Biwa. I became engrossed in the wonderful cacophony of viewpoints. Women who landed in San Francisco and then found themselves in a brothel in “J-town,” digging onions in Stockton, picking peas in Los Osos, or as a maid in the servants’ quarters of a large house in Atherton. For me, Otsuka’s unique approach really conveys how these women must have felt—as their personal sorrows were swallowed up by the hardships of so many. Otsuka has crafted a tour de force, with her very original working of the first-person plural. The voices overlay to form a narrative arc, as the women establish homes, give birth, and find their places in the community. There are also happy moments, and some find that they blossom in their new land, at least until the tragedy of Pearl Harbor and World War II upends them all again. If you pay close attention, a few characters do resurface as the novella progresses, such as Sumika in Montecito. My advice is to give yourself over to this book, as an original reading experience. I found it so engrossing that it almost flew by too quickly. I really did not want the story to end. But end it did. As the Japanese were rounded up and forced to abandon their homes and their businesses. In the dark of night they were ‘evacuated’ from the coast put on trains headed inland to the internment camps—their stories, their voices, scattered to the wind.